The Japanese beetle is known to feed on over 250 different species of plants. They are especially fond of roses, grapes, smartweed, over-ripe and decaying fruit, corn silks, and soybean foliage. 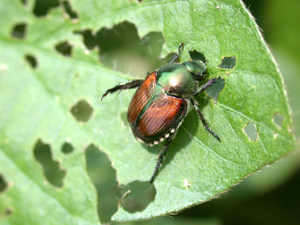 The Japanese beetle occasionally causes economic foliar damage to soybean. The adult is about 1/2 inch (13 mm) long, metallic green with bronze colored wing covers. Tufts of white hair are visible around its abdomen, just below the wing covers. The Japanese beetle larva, which is 1/4 to 1 inch (6 to 25 mm) long, resembles May/June beetle and masked chafer grubs. The larva overwinters deep in the soil and completes its growth the next spring. The adult emerges from the ground in mid-summer and usually can be found from late June through September. Eggs are laid in the soil and hatch during July and August. The larva, which passes through three instars, feeds on live or decaying plant material in the ground until frost. The Japanese beetle skeletonizes soybean leaves, stripping away the tissue between the larger leaf veins. Its damage resembles Mexican bean beetle feeding, however, the Japanese beetle destroys more of the smaller veins. The larva rarely damage soybean roots, feeding primarily on decaying plants and roots of some weed species. If large numbers of Japanese beetle are found in a field with noticeable defoliation, take 20 sweeps with a sweep net in each of 5 field areas. Record the number of beetles found in each area. 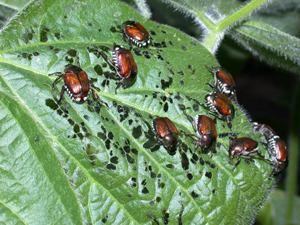 Consider that Japanese beetles are usually not uniformly distributed throughout a field. Determine the percentage defoliation level for individual plants in each sampling area of the field and estimate the average percentage defoliation level for the field as a whole. 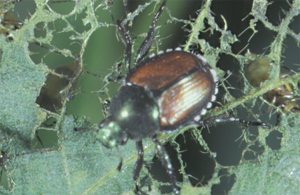 Since the Japanese beetle feeds on the upper portion of the soybean canopy, defoliation estimates for the whole plant or area are often over estimated.